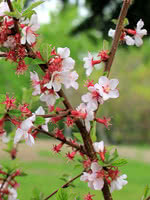 Nanking Cherry is a small deciduous shrub known for its attractive white blossoms and edible fruit. It is a winter hardy and moderately fast-growing plant. 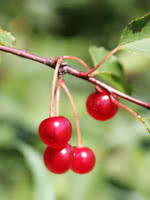 Nanking Cherry's dark red fruit is excellent for pies and jellies. It is also highly regarded as a shade tolerant fruit. We often see it planted as a hedge on the north side of a house where few other plants will survive, let alone thrive. Nanking Cherry does flower early and, as such, is susceptible to hard late frosts which may wipe out the cherry crop. Many people plant them right up against their house or behind their shelterbelt to mitigate this risk. Expect fruit mid to late July. The fruit can vary in sweetness and size considerably. We often hear that people prefer it to sour cherries. Perhaps this is because Nanking Cherry is more closely related to plums. 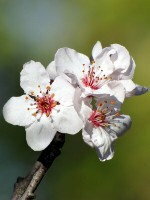 In fact, it is sometimes used as a dwarfing rootstock for plums. Container seedlings that have been transplanted to our bareroot fields for a second growing season. These are good-sized plants, and are generally better branched and more robust than container stock.